The old Swedish army rucksack. 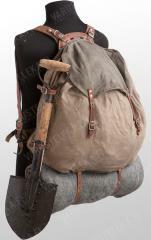 Basically a 35-40 l canvas pack with a metal frame and high quality leather straps. 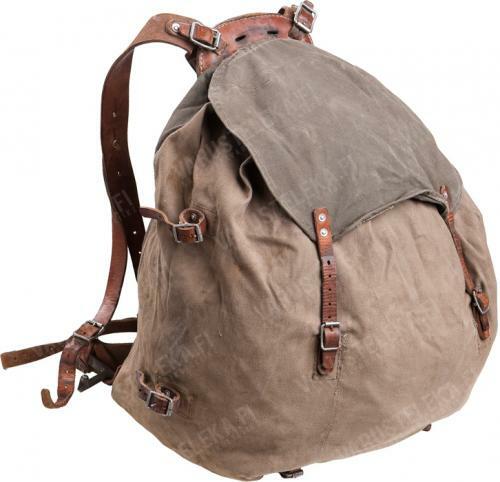 This is essentially the same model as original Bergans of Norway rucksack used by allied paratroops, commandos, special forces and anyone else lucky enough to get sent up mountains or into the arctic. These are getting a bit rare - we got a handful! 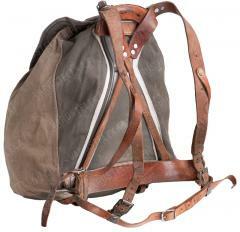 If you loathe synthetic materials, try this - the whole thing is made of cotton duck, leather and steel! A very simple model: the mouth is closed with a tie-string and straps are of course fully adjustable. Two leather cargo straps at the bottom allow some extra stuff to be carried there, like a rolled blanket or shelter half. These are from the good old days when Sweden heroically fought in WWII. After winning the war, they decided to keep these in use to show everyone else who's boss in Scandinavia. Used stuff. Although these are in good serviceable condition, some leather grease & slight oiling wouldn't hurt - these are pretty old. Do that, and this will probably last forever.